In its first year, the Audi RS 3 LMS has already been a commercial success for Audi Sport customer racing. 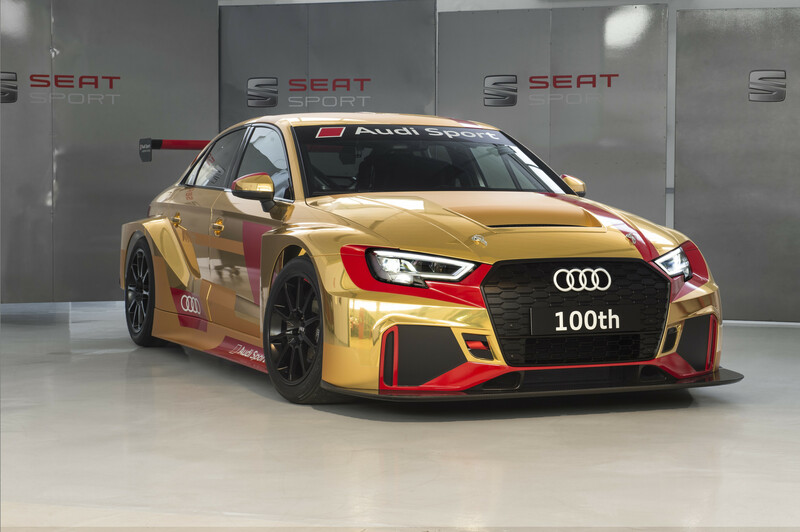 At the first Audi Summit hosted in Barcelona, the customer racing department presented the 100th touring car from its production line. Audi Sport customer racing celebrates production centenary of the Audi RS 3 LMS: Presented in September 2016, the Audi RS 3 LMS is not yet one year old but it is already celebrating its first great production milestone. 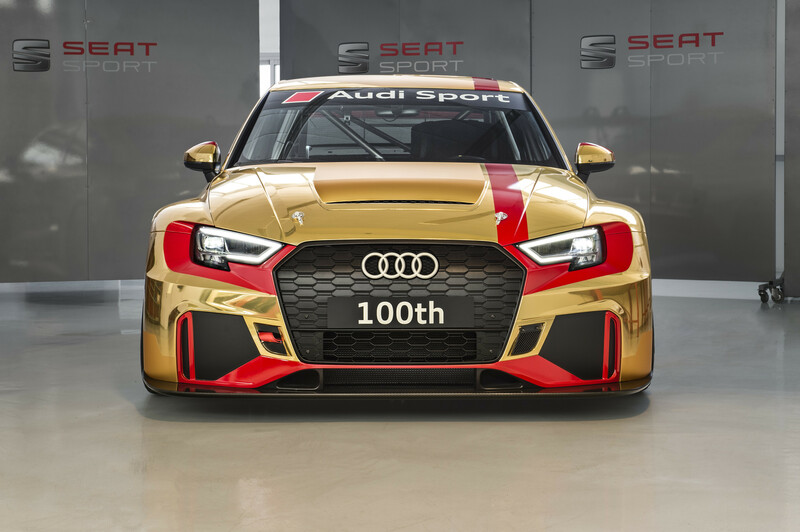 In July, Audi Sport customer racing produced the 100th example of the 350 hp race car within the group. The group has combined the assembly of all TCR race cars of its brands at the Martorell site in Spain. 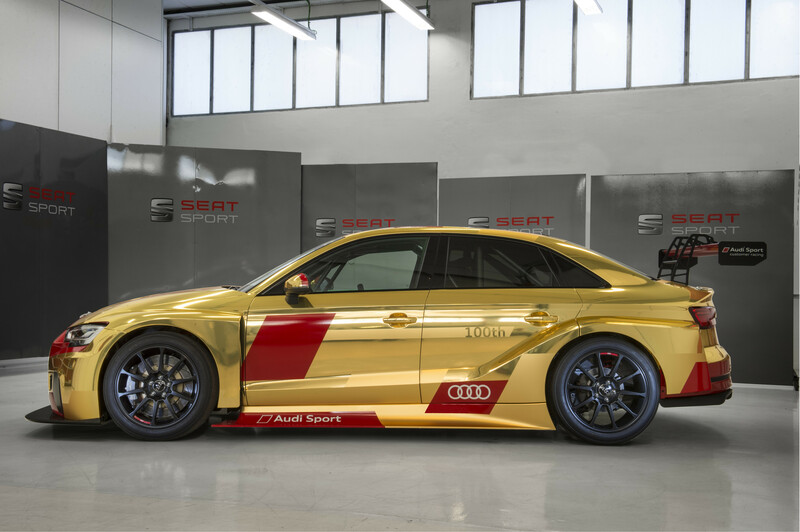 Junior racing driver Joonas Lappalainen steered the golden-painted celebratory model across the stage before invited guests at the first Audi Summit Brand Show in Barcelona. On the following day, the management team of the customer racing program from Audi Sport visited the employees of the racing department at Martorell. Chris Reinke, Head of Audi Sport customer racing: “In just its debut season, we have already delivered 90 examples of our race car to customers around the world and have received preorders up to the 100th model. We’re proud that our entry model for touring car racing has gone down so well and that it is already such an important pillar of our model range. My thanks go to our colleagues in Spain for the excellent work in building our race car.” Since January, customer teams have already contested 125 races on three continents – America, Europe and Asia. They have achieved 73 podiums, including 24 victories, at both 12 and 24-hour races, among others. The TCR class is a growing international category. So far, 13 series have already been set up worldwide just for those models. In addition, there are six other circuit championships with classes for TCR models, as well as other racing disciplines such as hillclimbs, in which Audi is also present. Two trophies for Audi customers in Italy: At the fourth of seven race weekends of TCR Italy, two Audi drivers piloted their Audi RS 3 LMS cars to podium results. Plamen Kralev from Kraf Racing finished second in the first race at Mugello, trailing the winner by only two seconds. The Bulgarian remains the best-ranked Audi driver with third place in the standings. In the second heat, Max Mugelli from Pit Lane Competizioni finished third and improved to fourth place in the standings. Two podium results in Japan: Two Audi Sport customer racing teams achieved trophies and points in the TCR class of the Super Taikyu Series at the Autopolis circuit in Japan. Shozo Tagahara, Takuya Shirasaka and Naoto Takeda, in an Audi RS 3 LMS from Audi Team DreamDrive, crossed the finish line second in class after three hours of racing. Third place in class went to Koichi Okumura, Kei Akiyoshi and Kazuzo Ueno, who drove an Audi RS 3 LMS from Birth Racing Project. In the standings of the ST-TCR class, Audi Team DreamDrive moved up to second position after four of six race weekends. Alessio Picariello extends his lead: Alessio Picariello is at the top of the Audi R8 LMS Cup drivers’ standings as the season passes the halfway mark. In South Korea, the Belgian increased his lead from 31 to 47 points during the third of five race weekends. In the two races at the Korea International Circuit, the 23-year-old junior driver clinched a fourth place in the first heat and then he took his third victory of the season in the second heat, finishing ahead of Cheng Congfu from China and Shaun Thong from Hong Kong. The first race was won by veteran Alex Yoong, who is also the reigning drivers’ champion. Yoong won the heat ahead of his Malaysian compatriot Mitch Gilbert and Shaun Thong. Gilbert is currently second in the standings with two events to go.